Crius’s non-IFRS “Payout Ratio” includes multiple questionable adjustments which have given investors a false sense of security. We think Crius is on the precipice of failure. Crius is liquidity constrained with only $24.3m in cash as of September 30th. A new preliminary legal settlement of up to $18.5m will deplete much of its remaining cash. Credit lines are similarly stretched. Crius had $104.6m of debt as of quarter-end with current estimated remaining available credit of only $25.2m. The Company is borrowing at rates as high as 9.5% while paying out dividends at ~9.3%. Current dividend payout rates imply an unrealistic C$47.7m annual payout. Crius’s early backers and potentially current key holders include individuals affiliated with hedge fund Platinum Partners, whose executives were indicted for operating “like a Ponzi Scheme,” according to federal prosecutors. We believe many investors look at Crius Energy Trust (TSE:KWH.UN, OTC:OTC:CRIUF) and mistakenly believe it to be similar to a traditional electric utility. After all, much like a utility, Crius ((i)) is involved in the business of providing energy to retail and commercial customers; and ((ii)) Crius pays out a substantial, regular dividend with a seemingly conservative payout ratio. Crius’s business model is wholly unlike a traditional utility, yet the Company offers a utility-like proposition of a steady, increasing, “conservative” dividend which has created what we believe to be an unsustainable mismatch between investor perception and the company’s financial reality. To date, that mismatch seems to have been largely ignored due to investor reliance on metrics such as Crius’s non-IFRS dividend “Payout Ratio”, which includes several questionable adjustments. Regardless of perception, the reality of Crius’s financial situation appears to be coming to a head in the form of a near-term liquidity shortage. We think the current liquidity situation of Crius not only calls into question the sustainability of its juicy ~9.3% annual dividend payment but also calls into question the near-term solvency of the business in the absence of further capital injections. The company recently agreed to a preliminary settlement of up to $18.5 million in relation to a lawsuit over sales practices from its historical Viridian subsidiaries. This compares to a $13 million reserve recorded by the company according to page 33 of the Q3 Financials. In December, Viridian quietly announced to its independent contractors that it is imminently transitioning away from its core multi-level marketing sales channel, leaving that business essentially in runoff. Viridian is estimated to account for about 20% of Crius’s current customer base. The legal reserve Crius has in place will cover the administrative costs, legal fees and the claims from the class action settlement. Crius has entered into an arrangement which is commonly used by companies settling class actions to cap the Company’s exposure. Management does not expect to incur any further material costs associated with the settlement of the class action lawsuits. Other regulatory screws are tightening as well, including NY and NJ AG subpoenas and pending regulatory rulings in relation to Crius’s recently acquired subsidiary, U.S. Gas & Electric (“USG&E”). The company recently switched its auditor from “Big 4” Ernst & Young to Grant Thornton in March 2017. On top of everything else, we find the company’s origin and historical associations to be unsettling. The company’s early backers and potentially current key holders (up to 11% of outstanding units) include individuals affiliated with senior members of the defunct hedge fund Platinum Partners, whose executives were indicted for operating “like a Ponzi Scheme” according to federal prosecutors. We identified one defendant in the Platinum case who even pledged Crius shares in order to secure legal counsel for his upcoming securities fraud trial. In sum, we believe Crius is on an unsustainable collision course and will need near-term and ongoing infusions from the capital markets in order to continue its operations. We think the company is on a path to zero unless it undergoes a major business shift or find large, less competitive and less regulated markets to operate in. Starting from the beginning, a deep dive of Crius’s history shows a rather unsavory origin story. Namely, Crius seems to have been backed in the beginning by former executives and affiliated individuals from Platinum Partners, a hedge fund that later collapsed and saw its key executives indicted on multiple counts of securities and/or wire fraud. Prosecutors allege that the fund became “like a Ponzi Scheme” as its largest investments lost much of their value. Mark Nordlicht, who was the founder and chief investment officer of Platinum Partners, and was later indicted for securities fraud in December 2016. David Levy, who was the co-chief investment officer of Platinum Partners, and was later indicted for securities fraud in December 2016 alongside Nordlicht. Murray Huberfeld, who was a founder of Platinum and participated in its management, and was later indicted for honest services wire fraud in July 2016. David Bodner, who was a long time partner of Huberfeld. Note that none of the charges cited above have been proven in court. Going back to the beginning… prior to working as CEO and CFO of Crius, Michael Fallquist and Roop Bhullar worked at a now-defunct publicly traded company called Commerce Energy. Fallquist served as Chief Operating Officerof Commerce and Bhullar served as Finance Director. In mid-2008, Commerce Energy borrowed from an affiliate of Platinum Partners called AP Finance, LLC. Commerce Energy soon defaulted on the loan and the company appears to have been liquidated with some of its assets sold off to rival Ambit Energy. 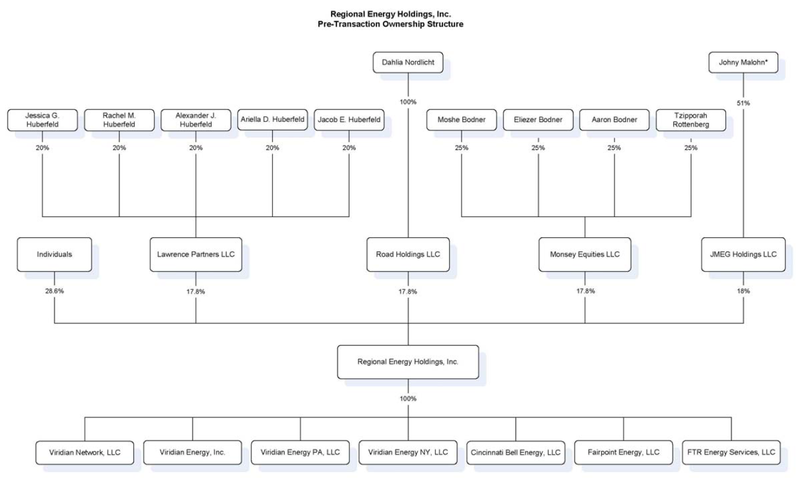 Platinum then brought Fallquist on directly in order to run Viridian and its affiliates, including parent company Regional Energy Holdings, LLC (REH). A whistleblower in March 2012 similarly detailed that the ownership of REH and Viridian included key Platinum executives and stressed the importance of the roles of Platinum Founders Mark Nordlicht and Murray Huberfeld (pg 5). The whistleblower also noted that Viridian was founded just weeks after the demise of Commerce Energy and operated in Platinum’s offices (pg 9). A subsequent March 2012 Public Utility Commission filing by Viridian corroborated much of this as well. As noted in the PUC filing (pg 17) “Mark Nordlicht indirectly owned 17.84 percent of REH”. The filing also noted (pg 4) that David Levy served on REH’s Board of Directors and Executive Committee until March 2012. The REH holders cashed out about C$32.3 million in the IPO (IPO Prospectus pg. 64). Following the IPO, Crius essentially bought out the remaining non-controlling interest from its early holders in 2 phases: (1) a 2015 all-cash purchase of part of the remaining interest and (2) a 2016 deal consisting of cash and an exchange into Crius units to complete the purchase. It is nearly impossible to determine how many Crius units, if any, are still held by the original Platinum/REH holders, but at least one of the original Platinum holders still appears to hold a meaningful number of units. We located a Uniform Commercial Code (UCC) filing showing that Platinum co-chief investment officer David Levy recently pledged 250,000 units of Crius in order to procure his criminal defense attorney for his upcoming securities fraud trial. Long story short, we are unnerved by Crius’s history and associations and believe it adds a layer of questions regarding the Company’s approach to business. Industry analysts have similarly described the company as a utility, and authors have referred to it for example as, “a High Quality Utility” and a “9% Yielding Utility“. Despite the common perception, Crius’s business model is nothing like a traditional utility company. Crius primarily operates as an electricity and natural gas provider in the deregulated energy markets, also commonly known as an Energy Service Company (or “ESCO”). Unlike utilities, ESCOs like Crius do not have monopolistic infrastructure such as power plants or transmission lines that they can monetize for steady streams of cash. On the contrary, ESCOs offer a product that is a near-total commodity with almost no barriers to entry. They purchase wholesale electricity and natural gas on the open market (i.e. : on typical commodities exchanges) and simply sell it to commercial and residential customers at a markup. The core business of ESCOs therefore amounts largely to marketing, sales, servicing, and billing its customers. Due to the lack of barriers to entry, ESCOs like Crius operate in a fiercely competitive environment. In New York alone, there are 151 ESCOs serving the electricity markets, according to the New York Department of Public Service. Such fierce competition manifests itself in numerous ways, including the very high customer turnover experienced by the Company. Unlike utilities that tend to have a very stable customer base, Crius’s customer attrition has averaged 10.3% per quarter on an LTM basis, representing roughly a 41.2% annual customer attrition rate [10.3%*4]. We believe the mismatch between the competitive industry Crius operates in coupled with its generous dividend payment has led to a precarious liquidity position. As of the recent September 2017 quarter-end, the company had cash of $24.3 million and available credit of $25.2 million excluding a temporary $20 million bump in credit availability that expired in the 4th quarter. (Source: Q3 MD&A pg 7) Net of the full burden of a recent preliminary class action settlement for up to $18.5 million the company would be left with cash of only $5.8 million. Investors have come to expect both the high dividend rate and the steady increases over time, and the Company has obliged to date, having issued 8 straight quarterly dividend increases.2 Furthermore, on January 30th, 2018, the company announced an intention to make a Normal Course Issuer bid (a Canadian form of a stock buyback) representing up to 10% of the public float. Despite this optimistic signaling we believe Crius’s financial profile puts the dividend in imminent jeopardy in the absence of further dilutive equity issuance. 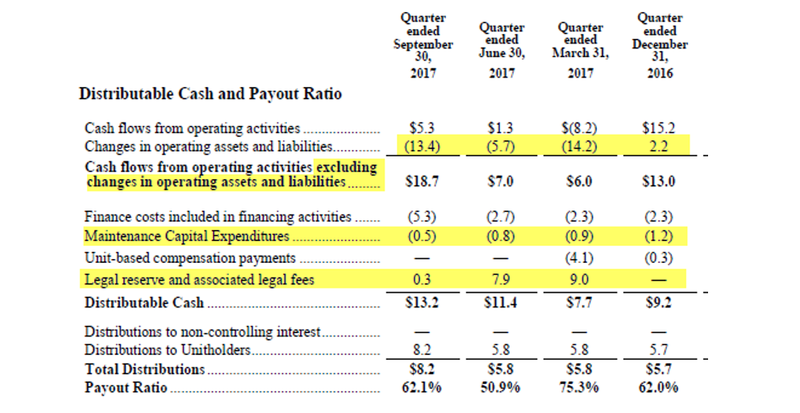 First, the metric excludes “changes in operating assets and liabilities” which neglects the company’s negative (and recently growing) working capital deficit of $23.2 million as of last quarter, as mentioned above. Second, “legal reserves” are added back despite settlements that were expected imminently, by the Company’s own statements: “Management has entered into agreements in principle to settle these matters and expects to announce such settlements within the next few months.” We don’t see how such imminent expected detractors from the cash balance could reasonably be considered an add-back to Distributable Cash. Note that as mentioned above the company has agreed to a preliminary settlement of up to $18.5 million in the Viridian case, further underscoring that settlement proceeds are not a realistic “add back” to distributable cash. Update: See above (intro paragraph) for investor relation’s response to our question on Viridian post-publication. Third -and in our view most importantly – only “maintenance capex” is deducted from its Distributable Cash. Maintenance capex is defined as excluding acquisitions. What this means is that the company is using investing cash flow to buy customers which increases near-term operating cash flow. The operating cash flow increase is then included in its “Payout Ratio” while the investing capital required to create that increase is then excluded. This strikes us as a classic “give with one hand and take away with the other” scenario. To give a sense of the magnitude of this dynamic, Crius has paid over $202 million in the past 2.5 years to acquire businesses that have added 631,000 customers, representing a significant portion of its reported 1,446,000 customer-base as of last quarter. This includes the substantial $175 million USG&E acquisition last year that added 350,000 customers. To demonstrate this through an analogy, the situation strikes us as similar to constantly dumping buckets of water into a bathtub that has a giant hole in it. If you look into the tub at any given moment, it will appear to have some liquidity sloshing around, but once you stop dumping in new buckets of water, the tub quickly runs dry. By ignoring the need for new buckets and simply looking at only the water in the tub, one is left with a vastly incomplete picture of sustainable liquidity. On the subject of attrition, it appears that a significant portion of the Company’s historically high-margin business is now effectively in run-off. On Viridian’s Facebook page, we found dial-in instructions for a December 4th call. On the call, Viridian EVP Robert McFadden announced at 3:16 that “Viridian is transitioning out of the relationship marketing channel” and is transitioning into a customer acquisition channel through “more traditional” means. The call noted that Crius will continue to service the existing customers, but as of March 1st, Viridian is no longer accepting new leads through its multi-level-marketing (or “network marketing”) channel, essentially leaving that business in run-off. Despite this announcement to Viridian’s contractors, we could find no mention of the transition away from Viridian’s multi-level-marketing efforts in Crius’s investor communications. 2016: The company stopped breaking out Viridian’s sales separately, and divested 90% of the business while retaining the right to own and service all existing and future electricity and natural gas customer relationships, according to the July 19th, 2016, press release. While Crius’s filings don’t currently break out its customer base by sales channel, an overview brochure on the Viridian website described the company as “an energy partner helping more than 300,000 customers make smart energy choices.” Given that Crius’s overall customer base was 1,446,000 as of September 30th, Viridian’s estimated 300,000 customers represent roughly 20% of the company’s customer base. We believe Crius’s massive acquisition of U.S. Gas & Electric (USG&E) is an attempt to plug the hole left by the company’s customer churn, tightening financials, and the transition away from its historically crucial multi-level-marketing sales channel. The USG&E acquisition strikes us as a Hail Mary that will have a temporary ostensible improvement in operating cash flow while destroying value in the medium term. ~$94.4 million consisted of “goodwill”, which is largely comprised of “the value of the assembled workforce and synergies and economies of scale”. ~$111.8 million consisted of “customer accounts”. The balance mainly consisted of a ~$42.5 million deferred tax liability (which lowered the purchase price), the netting of working capital accounts, and PP&E. As to the goodwill, in the Q3 2017 press release, the company stated that it expects “annual run-rate after-tax cash synergies of $12 to $14 million” and clarified on the conference call that $10 to $12 million of those synergies would come from G&A. Crius CFO Roop Bhullar also stated on the conference call that USG&E’s G&A was about $20 million, suggesting that synergies would represent cuts of between 50% and 60% to G&A. USG&E already went through a series of layoffs and G&A cuts prior to its sale, according to multiple sources we spoke with. If there was any significant excess to be trimmed, it seemingly was already cut prior to the acquisition. USG&E will add two new markets to Crius, Michigan, and Kentucky (per the presentation pg 12) which will likely necessitate its own managerial staff and G&A expenses. With the Viridian multi-level-marketing sales channel in run-off, Crius is likely going to heavily rely on USG&E’s telemarketing and door-to-door sales channels, which similarly necessitate overhead. Given the narrow justification for the USG&E acquisition on a mere grossmargin basis, the net contribution after factoring SG&A and the company’s overhead suggests that the USG&E acquisition will likely be completely destructive to value regardless of whether Crius’s unrealistic synergy targets are achieved. In New Jersey, the state Attorney General initiated requests of information related to New Jersey Gas & Electric regarding its customer agreements, pricing and complaints received in February 2016. New Jersey Gas & Electric responded to the Attorney General’s requests and the matter remains pending. USG&E is also subject to regulatory actions by the New York Public Service Commission and the Maryland Public Service Commission that are ongoing and pending resolution. The prospectus also clarified (pages B50-B51) that the New York AG and the New Jersey AG have both subpoenaed USG&E, collectively asking for information regarding customer complaints, pricing, marketing practices, and customer agreements. Given that New York accounts for 26% of USG&E’s 2016 revenue, (according to the same short form prospectus pg 37), a New York action in particular could be highly destructive. USG&E’s same subsidiary was hit by a class action lawsuit in Pennsylvania that recently settled for $1.25 million and $475k in attorney’s fees. See the original complaint here. In all, it seems that Crius vastly overpaid to purchase USG&E right when USG&E became forced to constrain its business practices to adjust to tighter legal and regulatory pressure. Offering variable rate plans and then spiking the price 4x-6x higher than the underlying market rates. Offering low fixed “teaser” rates, then switching customers to variable plans and spiking their rates. Raising variable rates even when the wholesale market rates go down. Viridian charges these exorbitant premiums without adding any value to the consumer whatsoever…Viridian does not either produce or transport energy. It has no role in running or maintaining energy generation or transport facilities; it does no hook-ups or emergency response. Indeed, Viridian does not even handle customer billing: that, too, is handled by the Distribution Company. Essentially, all that Viridian does is act as a trader in the transaction. Yet it charges much more than the Generation Companies receive for making energy and the Distribution Companies receive for transmitting gas and electricity, maintaining power and gas lines, and handling emergency services and customer billing and calls. Note that the allegations were not proven in court and likely never will be on account of the pending settlement. The kinds of legal issues facing Crius and its new USG&E subsidiary are not unique to just them. These issues are affecting the deregulated energy industry in general. One of the key root issues driving this is that the fierce competition and sales-focused nature of the ESCO business model has fueled rampant controversial business practices. If you’ve ever had someone knocking on your apartment door claiming to be from the utility company saying something like “we’re making sure people get our new lower rate program, just sign here to make sure you get the best rates” you have likely already met a salesperson operating in this market. Unscrupulous business practices translate to dollar signs for class action law firms. Regulators have similarly responded, fueled by the numerous consumer complaints and powerful interest groups that have taken aim at ESCOs. One such example of states taking aggressive regulatory action is New York. Crius does not break out sales by state, but we believe it is a key market for Crius given USG&E’s 26% stated revenue concentration in New York and given the relative large population of New York compared to other states with deregulated energy markets. We have zero tolerance for these unscrupulous companies, whose business model is to prey on ratepayers with promises of lower energy costs only to deliver skyrocketing bills. In May 2017, the New York State Public Service Commission upped the ante yet again and issued more than 170 subpoenas to ESCO providers seeking facts to be used in an “evidentiary hearing to determine whether consumers are paying fair prices for ESCO products and services”. We rarely focus on regulatory changes as a catalyst for our investment theses (because regulators can be quite slow), but given the pace of New York’s oversight moves, their stance on ESCOs, and the magnitude any new action would have on Crius’ business we believe it to be relevant. As noted earlier, other states have taken action (such as Pennsylvania’s action against USG&E’s subsidiary) and others have taken notice and opened investigations. Collectively, we believe the regulatory pressure creates an environment that forces tighter controls and more transparent sales and marketing practices. As the days of (allegedly) charging customers 4x-6x higher than underlying market rates and as other (alleged) unscrupulous practices get litigated or regulated out of existence, so too go the high gross margins. The decrease in gross margin as a percentage of revenue in the quarter is consistent with recent trends as a result of the increased mix of lower-margin commercial and municipal aggregation customers in the portfolio, partially offset by the addition of the higher-margin USG&E customer portfolio. For context: energy aggregation programs are when municipalities run a competitive bidding process to see which supplier provides power to the municipality. ESCOs will typically bid to supply the municipality for a fixed period of time (such as 1-3 years) for a fixed price per kWh for the length of the contract period. Individuals living in the municipality can choose to “opt out” of the fixed supplier relationship, otherwise, they are generally opted-in automatically. Given that competing ESCOs can purchase energy from the same wholesale markets as one another, the bids for aggregation contracts tend to be highly competitive and the margins tend to be quite low. The net result is that the winning ESCO gains a large number of customers, but the profitability of such relationships tends to be minimal. The net result is that (1) aggregate margins in the business have steadily declined and (2) customer count has become a less relevant metric for assessing the overall strength of the business. Many commentators have spoken optimistically of the future of Crius’s relationship with Comcast (CMCSA). On the company’s own “Why Invest” page a key component of the growth thesis is “significant upside from Comcast partnership”. In Q2 2015, Crius added New Jersey in August 2015. By Q4 2015, the company stopped reporting tangible numbers entirely, instead vaguely stating that it had “achieved continued growth in the quarter when compared to the prior quarter”. As it would turn out, Q3 2015 was the first and last quarter where Crius reported Comcast customer numbers in its MD&A. In Q1 2016, the company didn’t even state that it had achieved q/q growth, as it had in the previous MD&A. Instead, it was even more vague: “the Company continued to see growth in line with management’s expectations”. Management’s expectations were never quantified in the MD&A. In Q2 2016, the company reported that it had launched service in 4 new states under its Comcast Energy Rewards brand. Despite the growth in geographic footprint, by Q3 2016 Crius reported that “Sales from the Comcast channel have moderated”. In Q4 2016 through Q2 2017, the company reported that it had renewed its relationship with Comcast for 5 years and entered into a new agreement to jointly offer an Integrated Energy Platform with plans to be fully integrated by the end of 2017. Last quarter in Q3 2017, the company reiterated its plans to be fully integrated by the end of the year, and added plans to “recommence enrolling customers in early 2018″. Note that it was unclear from the MD&As that the company had ever ceased enrolling customers in the first place. We find the above fact pattern to be wholly uninspiring. The company had reported tangible numbers relating to its Comcast relationship in its MD&A for only 1 quarter almost 2.5 years ago, followed by vague references to the program and then a sudden indirect acknowledgement in the latest quarter that the program had stopped enrolling customers entirely. We called the Energy Rewards number to learn more about the program. As we found out, the contracts are fixed rate, suggesting that they are likely to be fairly slim margin. Without clarification on ((i)) actual customer additions and ((ii)) actual gross margin contribution from customers added through the partnership we view it as little other than a “brand name” partnership that sounds great on paper but will likely add very little to the bottom line. That being said, when factoring in the dividend payout (which chews up almost C$12 million per quarter at current payout rates), we see the company hovering around cash neutral for the next 1-2 quarters in a best-case scenario. As high margin customers continue to drop off we expect a potentially fatal cash crunch by summertime unless additional external capital is raised to bolster the balance sheet. We expect the company will seek to raise $50-100m around May-July or may even attempt another medium to large “accretive” acquisition around that time frame. From a customer standpoint, we think the company will continue to pick up more low-margin aggregation contracts. We anticipate splashy “headline” customer count growth that ultimately won’t do much to improve the cash flow situation. More specifically, the company recently lost several townships in New Jersey but picked up many townships in Massachusetts that will likely fill the “customer count” attrition hole in the near term. We found 40 townships in Massachusetts where Public Power (a Crius subsidiary) won competitive auctions to provide service. Start dates range from November 2017 to February 2018 with contracts ranging from 12 to 36 months in length at prices ranging from 9.318 c/kWh to 10.88 c/kWh. Ten of the contracts begin in Q4 2017 with the balance beginning in Q1 2018. Flemington and Rariton Townships in NJ switching back to JCP&L per a November 2017 announcement. Tom’s River also is switching back to JCP&L per an October 2017announcement. Howell Township is also switching back to JCP&L per a December 2017announcement. Montgomery Township also switched back to JCP&L per an October 2017announcement. Plumsted Township also switched to a new provider (Constellation) per an October 2017 announcement. Note that depending on whether the company fully hedges or floats some of the risk on these fixed contracts it could alter the risk profile of the business considerably. We have asked investor relations for clarification on the hedging approach to fixed contracts and have not heard back as of this writing. Should we hear from investor relations we will update this accordingly. We think the Crius business model is on the precipice of failure as the liquidity profile worsens and industry pressures intensify. We expect the company will continue to require more infusions from the capital markets in the form of either dilutive equity raises or large acquisitions. Best of luck to all. Based on 57,030,067 units outstanding as of January 29th, 2018. Source: Company press Release 1 and 2. ((i)) Crius generated a gross margin of about $37.34 per customer per quarter over the last 4 quarters. ((ii)) Adjusting upward to account for USG&E’s historically higher margin of 28.2% (as of the latest Q1 2017 [23,851/84,415] according to the short form prospectus pg. A-3), we estimate gross margin of about $50.5 per USG&E customer per quarter. ((iii)) Taking Crius’s LTM attrition rate of 10.3%, we assume that each customer lasts about 9.7 quarters therefore arriving at (50.5*$9.7) lifetime gross margin of about $489 per USG&E customer. USG&E had Q3 revenue of $58.484 million according to Q3 MD&A Pg 11. Excluding USG&E revenue, the company was left with $211.42 million on the quarter, a Q/Q decline of 5.02% from Q3 2016 revenue of $222.6 million. To arrive at this we looked at the explicitly named holders mentioned in the deal, which include Robert Gries, Macquarie Energy, and Crius CEO Michael Fallquist (who as a side note personally cashed out C$4,414,156.34 as part of the offering, according to pg 32). In the 2016 mixed cash and units deal Fallquist/Gries/Macquarie comprised 12,807,733 LLC Units out of a total 19,458,942 LLC Units in the offering, according to the June 1, 2016, Short Form Prospectus. When netting out the shares purchased from named holders in the deal that leaves 6,651,209 Crius units issued to the “various holders”. Given that Crius was formed 50/50 by combining Gries’ “Public Power” with the Platinum-sponsored REH, and given that Gries was explicitly named, we infer by process of elimination that the unnamed “various holders” likely consist in large part of the original REH holders. Disclosure: I am/we are short CRIUF.